How long a Task is allowed to go unedited. You can define these triggers or Metrics for each task. Sometimes it’s not just the time that a Task has been on a Workflow that’s important. how long it has been since the Task has been edited. a call was made, and this will re-set the task to green. Each step can be defined with the times required, and also if the Metric should be based on Edited or Moved. The color of a Task is based on the time since it was moved to this step in the Workflow. A step may have a green Metric for any Task that has been on that step for less than seven days. It will turn amber between seven days and a month, and after that, it will be red. This screen in the Workflow Editor shows where you can specify the sort of task Metrics a step should have. Each Task row includes an icon representing the current Metric for that Task. Move your cursor over the icon (or touch it on an iPad etc) to display information about the Task’s status. 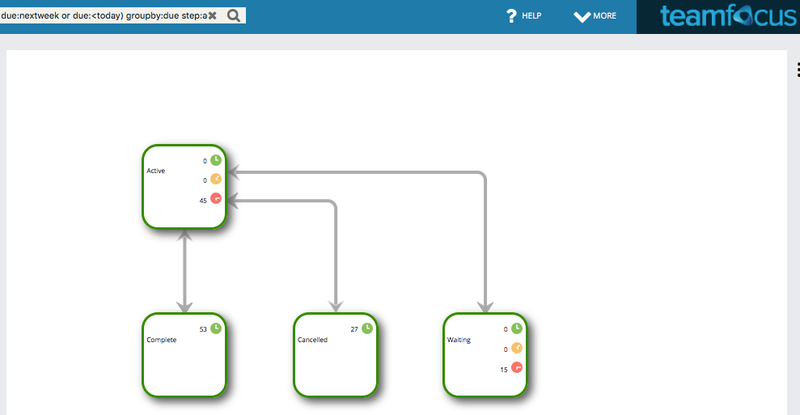 Click on the ‘Workflow View’ button at the top of your screen to display the Workflow version of the current View. This View makes it easy to see how many Tasks are at a particular Metric status on each step. When in the Workflow View, it’s easy to make a new Filter. Just click a colored Metric icon (green, amber, red) then click the “Save Search” link below the main search box and enter in a name for the new Filter. Click a colored Metric icon inside the step such as “Active”, and teamfocus makes a new search to show the Tasks that represents that part of the display. Searching by Metric is also easy using the color tag. Click on the word ‘active’ to make a search that shows all active Tasks, which immediately displays a list of the Tasks from this Metric or Step. This is a great way to drill down into your Workflow and see which Tasks might be causing problems. 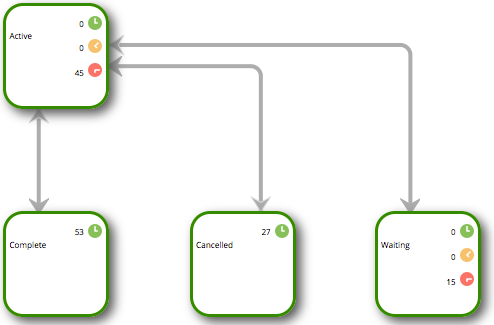 Some steps in Workflows, such as completed and cancelled, don’t need Metrics to be active. Since it doesn’t make much sense to have a completed Task turn amber after a month, Metrics can easily be disabled on any step. You’d like to get back to all of your clients 12 months following a major sale is complete. 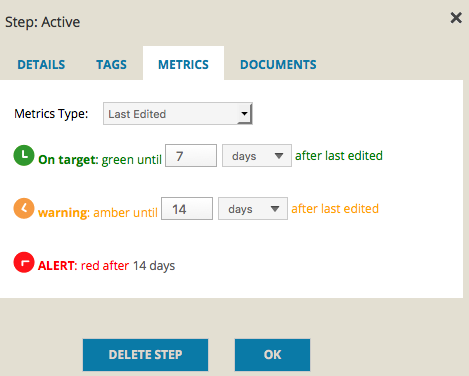 By putting an amber Metric on the completed Step, all tasks will turn amber in that Step after 12 months and will appear in one of your views. You can then call those customers back to see if they’d like a follow up. Search all Tasks that are at color:green and teamfocus will find all your green Tasks. Combine this with color:green and step:active to display all the green Tasks that are currently active. A manager might search using color:red at step:active. This would show you all Tasks that are no longer meeting the Metric standards defined in the workflow, thereby indicating where there are organizational bottlenecks.